Hi, friends!! 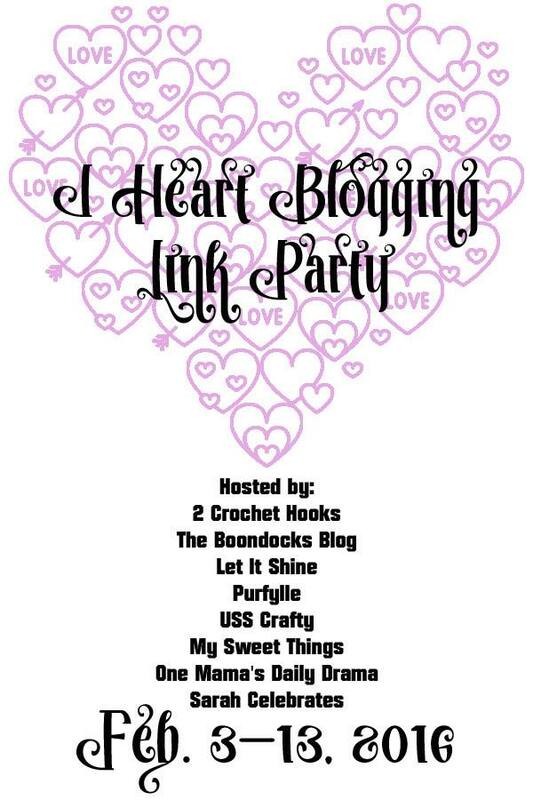 Welcome to our Heart Blogging Link Party!! When I started thinking about what to make, I remembered a friend of mine who show me some time ago a pretty thing she made for her husband. I rang her to tell what I was thinking and she hadn’t any problem with me sharing it. So today I am sharing what I did plus a free template for you to download in case you feel inspired to make one. All started with a piece of wood I was given by some friends, the same friends who get rid of these metallic drawers. I printed and cut some shapes, and used my Cameo to make some stencils, which I taped in place. 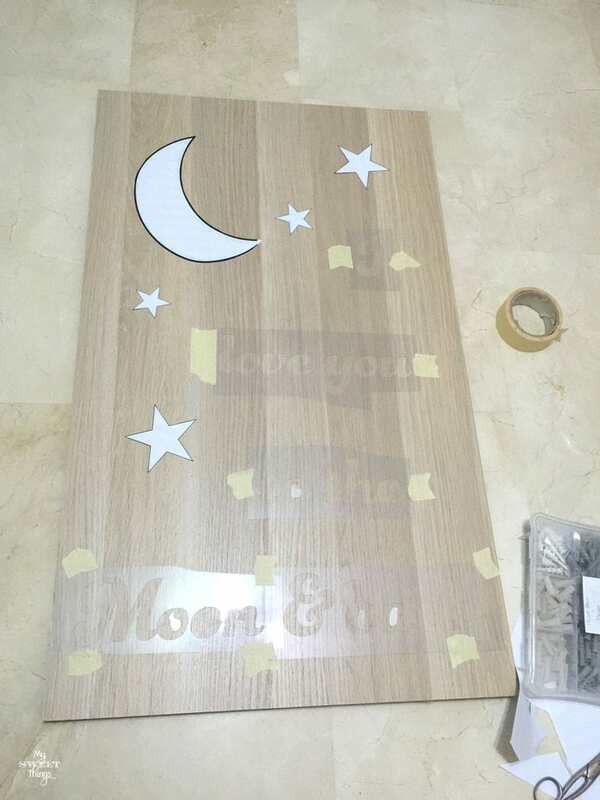 I hammered some nail heads to make the Moon and some stars. Then with some DIY chalk paint and a piece of foam I made the text. When working with stencils is better to tap than to brush the paint. I removed the stencil while still wet. Now it was time to add the string. I chose white because of the Moon’s color and the text. I outlined the Moon to get a more defined shape. I really love how it turned out, and how the white contrast with the color of the wood. I just need to wrap it and wait for Valentine’s Day to give it to my husband!! If you want to make your own, you can download the JPG template for free and high res here. If you want the Silhouette files, you can download file 1 and 2. And if you want the PSD file just send me an e-mail. What about you? Do you do anything special for Valentine’s? But the Valentine’s fun doesn’t end there! I’ve joined up with 7 other lovely ladies today to share and inspire some Valentine’s creativity. 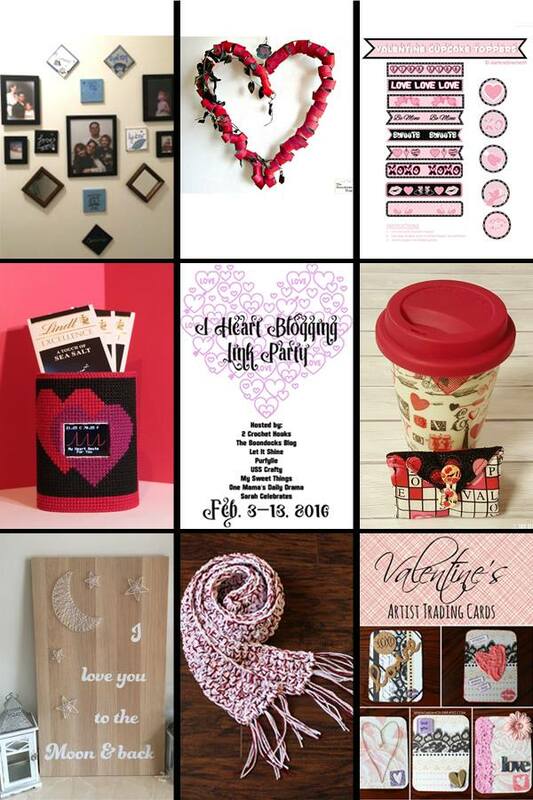 Stop by each one of their blogs today to check out their Valentine’s inspiration. Then… we want you to link up your Valentine’s creations! Did you make something awesome but you’re not a blogger? You can still share it and we need you too! Click that ‘Add your link’ button and in the Image Source section click the Instagram tab to find your creation in your feed. Let’s get linking and inspired for Valentine’s Day! 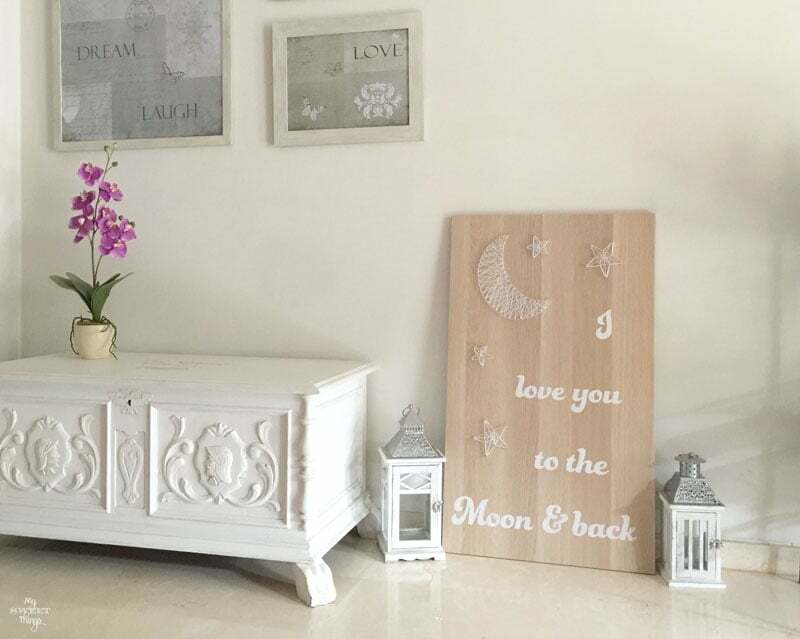 This entry was posted in Before & After, DIY and tagged Before & After, Decor, DIY, Me gusta reciclar, Pain, Paint, Reto Me gusta reciclar, Stencil, String, String art, Valentine's, Wall art, wood. This is so beautiful Pili! Your husband is going to love it! The string art makes it really special. It looks so intricate! And that sign is the best! Love it! Thanks for your kind comments, Mary. I love to try new things! Has realizado un cuadro precioso. 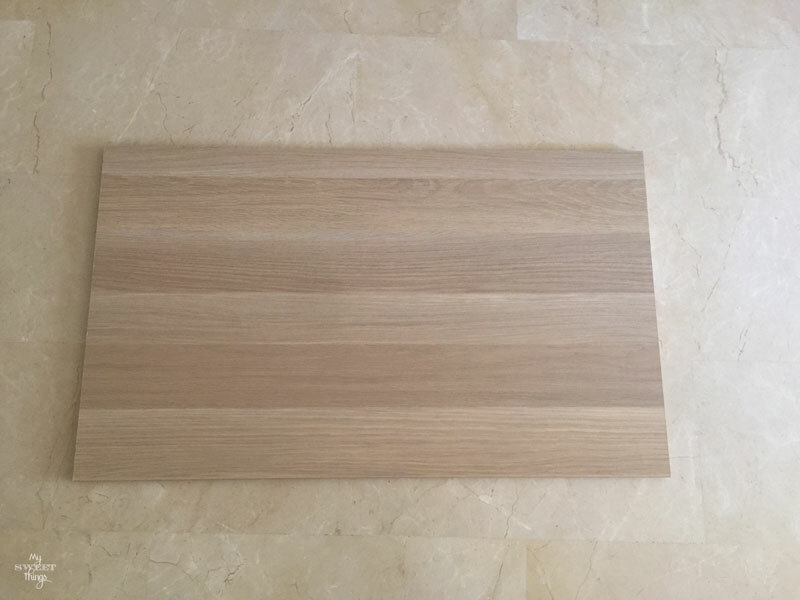 Como dices, qué buena combinación resulta siempre la madera y el blanco. Hola Isabel! La verdad que la Cameo es una auténtica maravilla. Yo la uso poco, pero cada vez que lo hago me enamoro más de ella. Quisiera tener más horas para poder practicar más! Thank you so much, Marci!! Glad you like it! Wow, that’s a big sign! Lovely Pili, I’m sure your husband will love it!!! The string art is really cool! Yes, it’s a big and heavy sign! I have too many scrap wood to get rid of and I think this is a great way to do it. This is so pretty! I haven’t tried string art yet, but your projects have really motivated me to give it a try. Thanks, Keri! It isn’t difficult at all and the result is impressive. 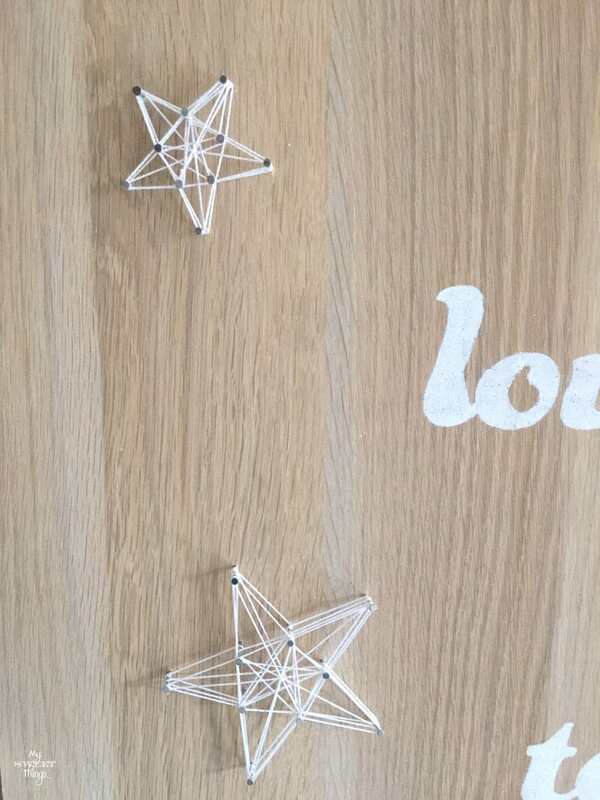 Pili, I love it…what fun to combine words and string art! 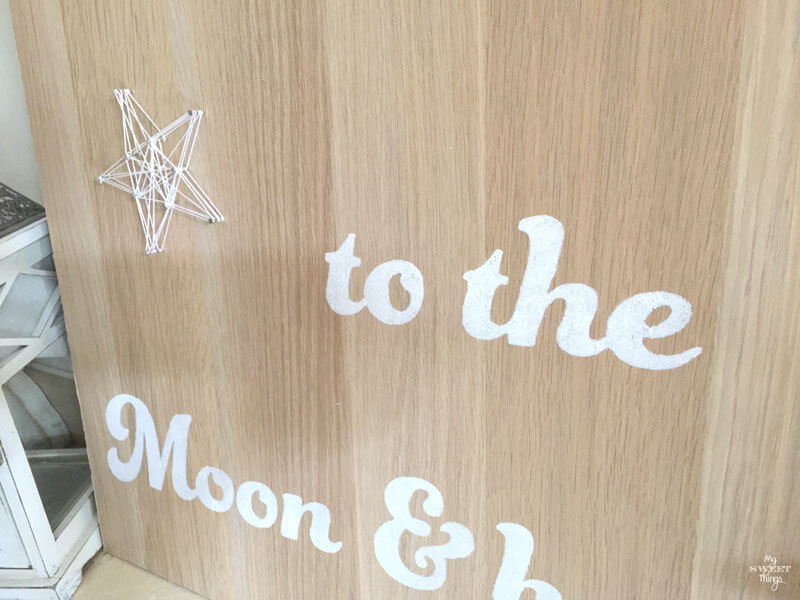 Thanks for making it easy…I may have to give string art a try! Many thanks, Michelle. I can imagine other designs using paint and string art. Not difficult at all, just a bit time consuming but relaxing at the same time, it’s like a meditation! simply beautiful! 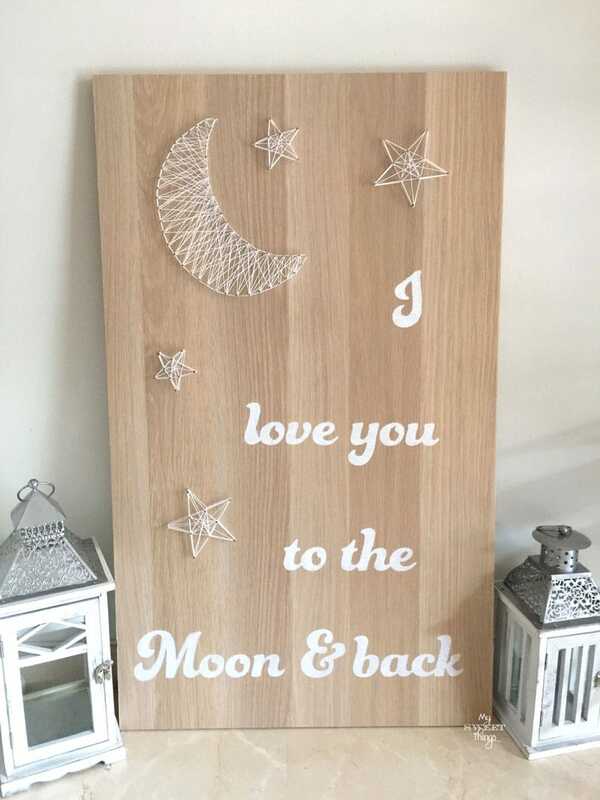 love the sentiment and the string art stars and moon. You have a ton of creativity! 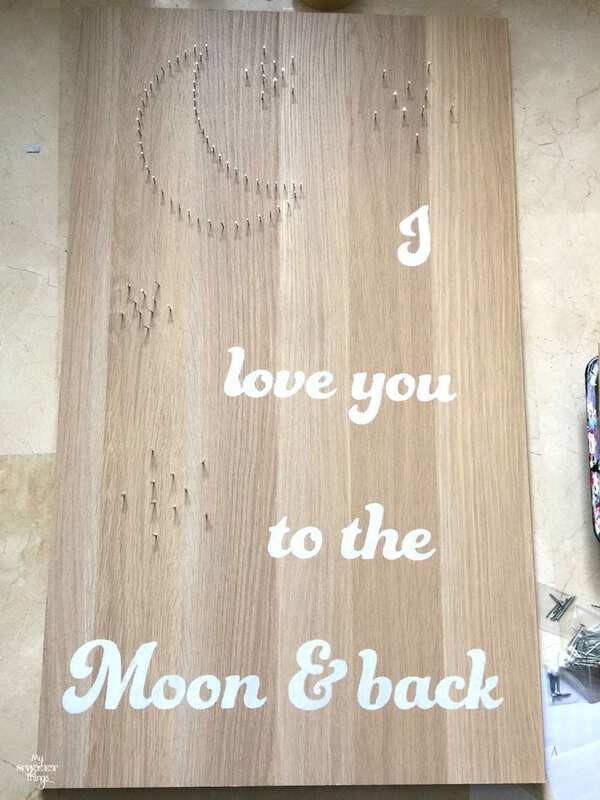 While perfect for Valentines, this I love you string art will be left up year round! Aww, that’s so sweet! Glad you like it too, and I agree it can be used all year round, why not? Love is in the air! This is such an elegant piece of art and there is something about the saying that just makes your heart want to burst with warmth. Thank you so much, Stella. I really appreciate your kind comment and it makes me happy that the saying moves you. I love this! I love really love the moon, and that’s such a pretty font! Glad you like it, T’onna! I love that font too! I had some trouble choosing one because there were some that looked great, but finally this was the winner. Hi, Cristina! Thank you so much for stopping by and your kind words. I’m sure you did a pretty Valentine craft! This is so sweet Pili!! Love how you mixed the different media! Thanks a lot, Anika! Glad you like it too!! Pili, that is just adorable! I love string art. My mom had one from ages ago… I wish I had snagged it when she was getting rid of it. Great gift! Hi, Sarah! I made once string art when I was a kid and the forgot completely about it until I saw something in Pinterest. Now I’m hooked! What a shame you didn’t kept your mom’s! YOU ARE SO TALENTED AND CREATIVE PILI!!! I just love this simple and elegant. Thanks so much for sharing with us at #Overthemoon it is beautiful. You are always so kind, Sue. Thank you so much for your kind words! Wow! How creative. I hope your husband knows how hard you worked on this gift. Very cute. Thanks for sharing on Your Inspired Design Link Party #21. That is just darling, Pili! I’ve wanted to try the string art but haven’t had the chance yet. What a wonderful piece of art! Thank you so much, Megin. I can understand you, there are so many things I want to try and I don’t find the time to do it! How pretty and it’s so great that you provided a template. Thanks for sharing at Snickerdoodle Sunday, Pili! Thanks so much for stopping by and for hosting, Beverly. I really appreciate your visit! Glad to hear that, Brenda! Have a great week you too! Love the addition of the string art! So much fun to do! Thank you for sharing with us at Brag About It! Have a wonderful Valentine’s Day! Many thanks for stopping by and leaving me your comments, Laurie. I really appreciate it! This is darling! Love the paint & string art combined Pili! 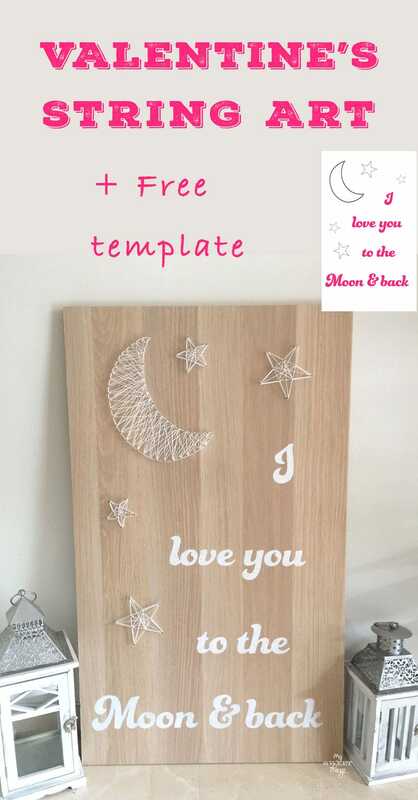 Your project is my pick for the week on the DIY Sunday Showcase:) Congrats! Thank you so much, Wendi!! Glad you like it as much as for being your pick! I love this saying and what you created is absolutely gorgeous! Perfect for Valentine’s Day! Many thanks, Ashley! I’m happy you like it too! Your string art always looks so amazing Pili. I think what you’ve created here is very romantic. I hope it went down well, I would certainly be appreciative. Pili, I absolutely love this! It’s so neat and different. It will catch the eye of anyone around it! 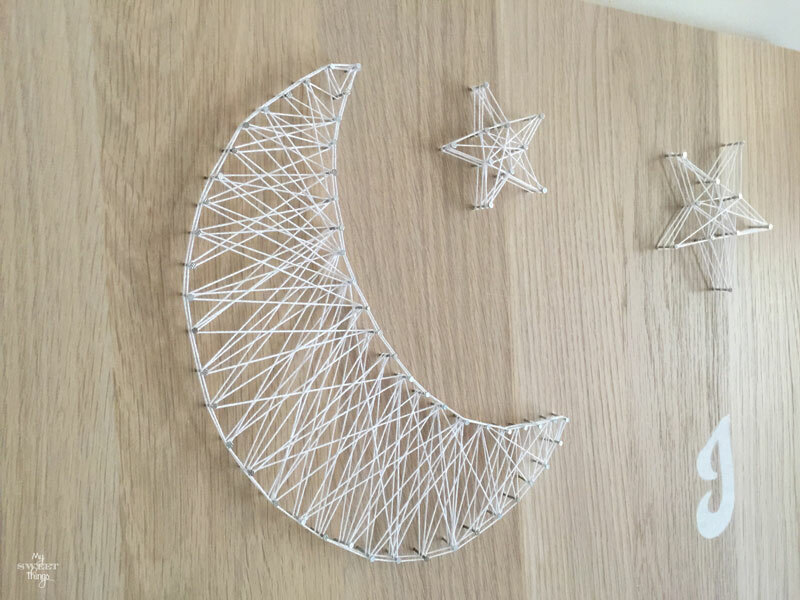 String art is so unique and I really like your spin on it! I would love to do a big orange goldfish, with a huge fan tail, I’m going to have to think on this, but using your tips I think I can at least try! How do you like your Cameo? 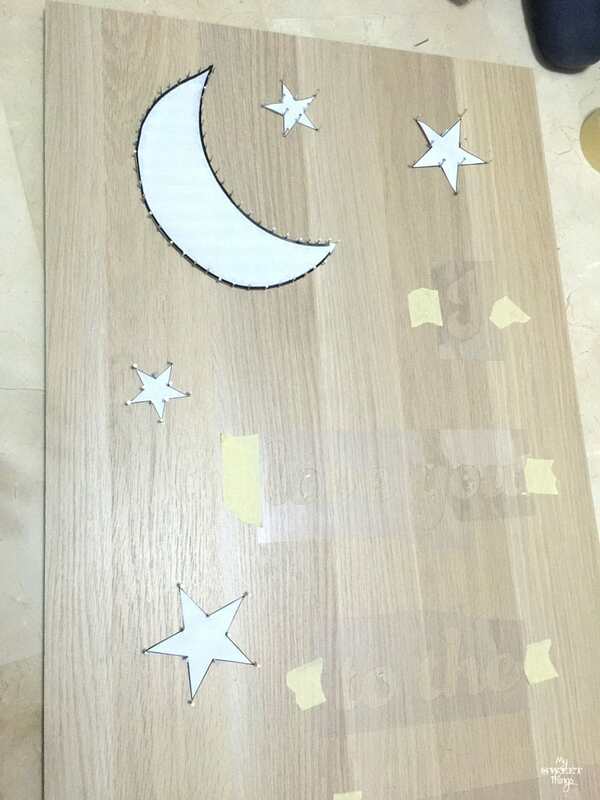 Can you make stencils with a sticky back that will apply to something glass? Or can you make t-shirt transfers with it? I’m really curious! Hi, Nikki! I can see that goldfish and it would look awesome! The Cameo is great, although I don’t use all the options it has… I need another life to make more things. 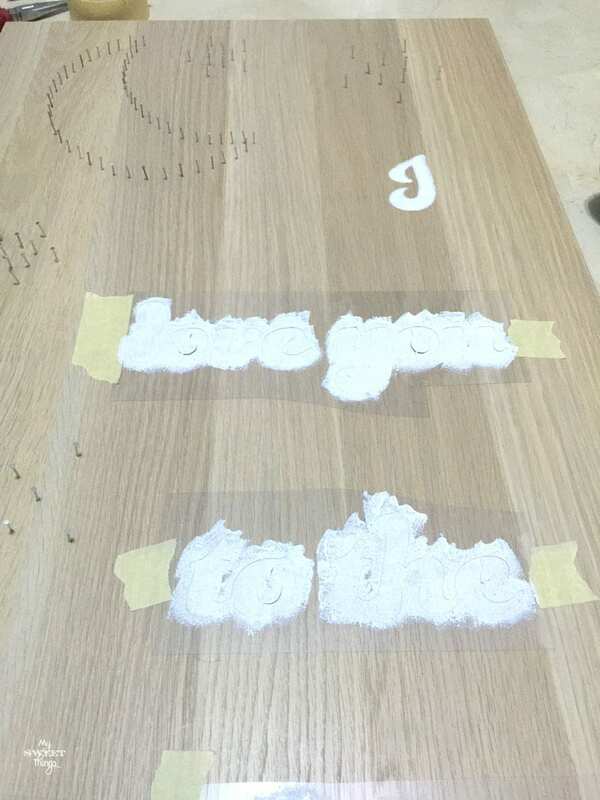 Answering your question, yes, you can use vinyl paper to apply the stencil to any surface, glass, wood, fabric. And if you buy heat on vinyl you can make T-shirts too. I tell you, I need another life!